I hope you’ve all had a fantastic weekend? I’m seriously wishing it wasn’t Sunday right now and could do with another day off! However, I’ve had a lovely day and even managed to squeeze in a very tasty BBQ with Daniel, so my Sunday blues aren’t too bad right now. I also wanted to share a few new beauty products that I’ve picked up myself and been sent, so I hope you enjoy seeing what’s new in my beauty collection. I was originally going to post my evening skincare routine today, but I honestly didn't realise how long it would take me to write out, so right now it's a working progress. I'm hoping to get in live by next weekend, so keep checking back if you want to see my evening routine and also how it helps to ease my anxiety. 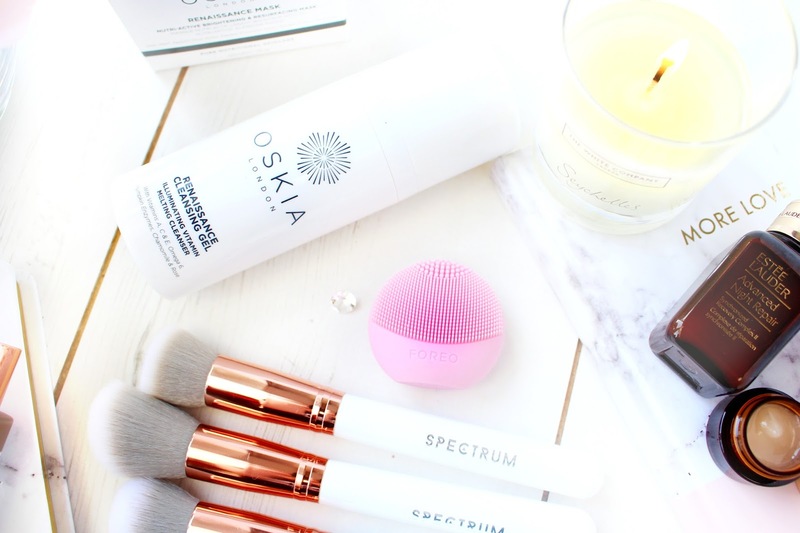 I recently blogged about this little beauty gadget here, but I thought I would add it into my Haul as it is new, and something I’m really loving. It’s a lot gentler than some of the other cleansing systems I have, plus it’s super cute and amazing to travel with! It does have a limited life span of 100 uses, but at under £30 it’s a great way to try out sonic cleansing at a more affordable price! I’ve been on the hunt for some new brushes for quite a while, but have kept putting it off. A little while back I spotted the super quirky and gorgeous mermaid collection by Spectrum, which sadly was and still is sold out. Last week I thought I would check out their website again and came across the BEAUTIFUL Marbelous collection! 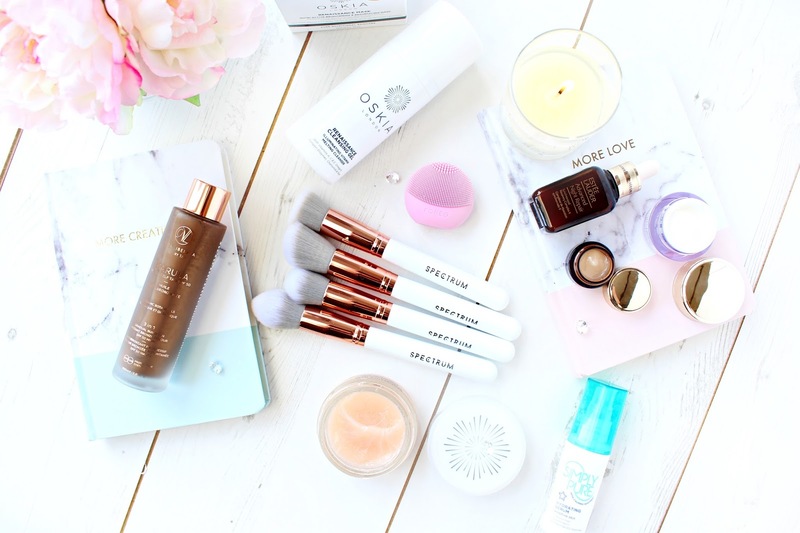 White & Rose Gold is my idea of heaven, so as you can imagine I had to add these to my online basket! I haven’t used them yet, but they’re the softest brushes I’ve felt, so I’ve got high expectations. I mean is it even okay to use something so pretty? Ha! I thought I would group these two together, as they’re definitely a dynamic duo. I feel totally late to the party with these, as they’ve been raved about in the blogosphere for as long as I can remember! I suppose I kept putting it off, as I have quite a large collection already. I did try the Oskia Renaissance Cleansing Gel in a small sample size before, but never really got to use it enough to see if I really liked it. 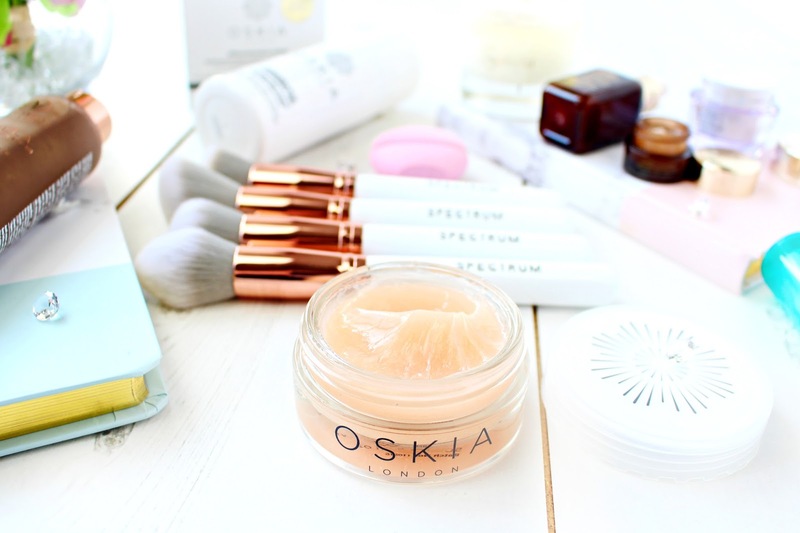 It’s funny what 15% off and a glass of white wine can do to a beauty-obsessed blogger! I’ve used these a handful of times and so far so good, but I will definitely update you once I’ve had a chance to properly use them. I popped into Superdrug the other day just to stock up on ibuprofen, as I walked through the door I saw a big stand with the Superdrug Simply Pure Hydrating Serum at under £3, so I instantly picked it up and put it in my basket. I tend to pay £50+ for serums, so after finding out it has tons of amazing media reviews, I'm hoping this could be the bargain of the year! It’s not anti ageing, but more of a hydrating serum, which will be fantastic for my dehydrated skin. My ANR II has become a real staple in my skincare routine. I notice such a huge difference when I stop using it, so I instantly repurchased, as I ran out of my 50ml bottle. Look Fantastic had a great gift set where you get 30ml of ANR II which is £50 on it’s own, but also a good size sample of the ANR Eye cream & their well loved Advanced Time Zone cream too All for £50. I’ve wanted to try the ANR eye cream for ages, so this seemed like a good gift set to purchase. The 50ml bottle has lasted me over a year, so I’m sure the 30ml will keep me going until Christmas! I can't seem to find this gift set on Look Fantastic at the moment, but there are similar options. 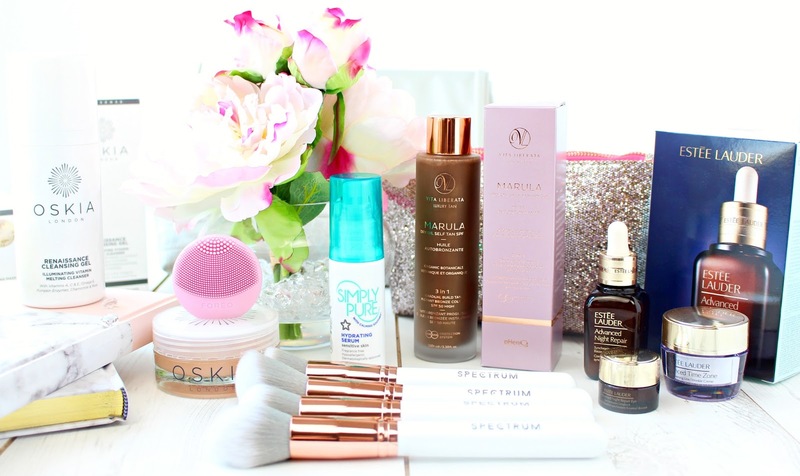 I was lucky enough to be sent the Vita Liberata Marula Dry Oil Self Tan and I'm super excited to try it out. It's the world's only self tan with an impressive SPF50. It gives a gradual tan for up to 10 days with buildable colour. East African Marula Oil is 4x more hydrating than Argan Oil with 4x more Vitamin C than Tahitian Monoi Oil, so I have pretty high hopes for this! I will be writing about this within the next few weeks, so keep an eye on my social media if you're interested to find out more! I hope you've enjoyed this post lovelies and I would love to hear from you in the comments section below. Have you or would you like to try anything from today's post? If you would like to see any specific reviews please let me know! Please note any PR Samples are marked * All views are my own. Thanks Gemma! They are gorgeous. I love them, they're too pretty to use though ha ha! What an amazing collection of new items! I am (inpatiently) waiting to use more of my stuff up before investing in new products! Great collection of new products! Those Spectrum brushes are to die for - I've been keeping my eye on them for quite some time and I'll admit - I wouldn't mind putting the money in for them at their price! Soooon, I hope! Great selection. Those brushes look lovely! Wish I had them in the U.S. Thanks! They are gorgeous. I hope they ship to the US soon! what a great haul. how much did you like the EL night serum?